Head: posterior frons flattened and anterior part depressed; interocular space less than the width of an eye; eye large; interantennal carina and transverse carina behind labrum absent; labrum distinct; maxillary palp with palpomere 4 longer than 3. Antenna: with 11-antennomeres, not thickened apically; antennomere 3 longer than 2; 11 longer than 10. Pronotum: emargination on anterior margin shallow, without notch external to anterior seta; lateral margin strongly convergent from base to apex; lateral impressions absent; posterior angle sharp and acute. Elytron: lateral margin laminate, serrulate externally toward apex, slightly indented behind humerus; with 10 rows of punctures plus scutellar row. Venter: metepisternum distinct posteriorly; hypomera with transverse impression external to anterior coxal cavities. Leg: tibia not pointed externally, excavated subapically. Bolivia, Brazil, Colombia, Costa Rica, Ecuador, French Guyana, México, Panamá, Paraguay, Peru, Venezuela. Described species: 26 (Staines 2012). Key to the species: Spaeth (1938); Aslam (1965). Cocos, Geonoma (Arecaceae); Heliconia (Heliconiaceae); Bambusa, Chusquea (Poaceae). Aslam, N. A. 1965. 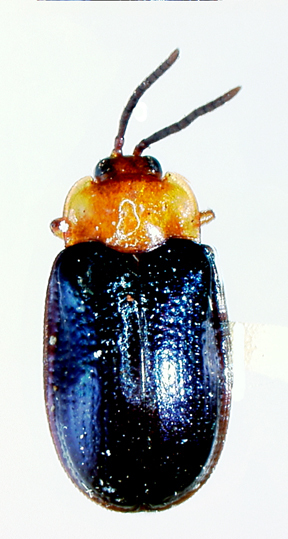 OnHispoleptis Baly (Coleoptera, Hispidae) and Imatidium F. (Coleoptera, Cassididae). The Annals and Magazine of Natural History (13)8:687-693. Baly, J. S. 1858. Catalogue of Hispidae in the collection of the BritishMuseum. London, 172 pp. Spaeth, F. 1938. Die Gattung Himatidium Fabr. (Col. Cassidinae). Revista de Entomología Rio de Janiero 9:305-317.